Tiffany is illuminated by the headlights of a line of black SUVs coming up the road from inside the olive ranch. The SUVs stop at the gate. Tiffany turns and gestures at the guard shack and closed gate. Her video image expands to fill the TV screen. VOICE OF JOHN [Breaking News anchor person]: There’s no word about what caused this unexpected closing? TIFFANY: There are reports that a caravan of SUVs arrived here earlier today, and during the recent festival in the town of Bolinas, a mercenary officer appeared to be doing reconnaissance. This olive ranch is owned by the Temple of the goddess Olema, but priests there have declined to comment. Wait a minute, something’s happening. TIFFANY CLERMONT: I’m here at the Holy Oil Olive Ranch to investigate reports of mercenary activity. We learned earlier today that guards are turning people away from this renowned tourist destination. As you can see, it certainly appears closed. MARSHA: Breaking News reporter Tiffany Clermont is on the scene in Olema, California to bring us some breaking news. The video screen behind the anchor persons shows Tiffany standing in front of a guard shack. She is next to a closed gate that blocks a road extending off into the darkness. TIFFANY: Let’s see what I can find out. Tiffany moves to the center of the road, blocking the path of the SUVs. The lead SUV stops in front of Tiffany. Tiffany moves to the side, so the Colonel can be seen by television viewers. He is wearing a combination ear piece and microphone. A man in military fatigues gets out of the first SUV. Tiffany approaches him, microphone at the ready. TIFFANY: I’m Tiffany Clermont from Breaking News. Can you tell our viewers what’s happening here? MERCENARY: Certainly, Tiffany. I’m Colonel Smith, commanding the Holy Oil Expeditionary Force. We’re responding to a request for assistance. TIFFANY: Who made the request? COLONEL SMITH: The priests of Bolinas. VOICE OF MARSHA: Be careful, Tiffany. Colonel Smith turns and heads back to his SUV. Tiffany follows him, holding out her microphone. The line of SUVs stretches back into the darkness inside the Holy Oil Olive Ranch. A pickup truck is faintly visible at the end of the line. TIFFANY: What form will your assistance take? COLONEL SMITH: I’m afraid that’s classified. I’ve said all I can right now. TIFFANY: What kind of help have they requested? COLONEL SMITH [facing the camera and appearing to deliver talking points]: Assistance with the moral, ethical, and religious crisis threatening the citizens of Bolinas. TIFFANY: But isn’t that a subject for the god and priests of Bolinas? COLONEL SMITH: Of course, in any matter of this kind we must respect the wishes of the local god or goddess. Colonel Smith stops, listening to something in his ear piece. TIFFANY: Do you have authorization from California authorities for this action? Colonel Smith signals with his hand, and two mercenaries dressed in fatigue uniforms get out of the second SUV. COLONEL SMITH [speaking to his headset microphone]: I’m not sure that’s a good idea. OK, Balboa, if you say so. One of the mercenaries takes Tiffany by the arm. COLONEL SMITH [turning back to Tiffany]: Why don’t you come along with us? You can cover all the action up close and personal, as they say. The Breaking News video picture shows the second mercenary approaching the video camera. The picture gyrates, shows a glimpse of Tiffany being handed into an SUV, and goes black. The television picture shifts to the Breaking News studio. Breaking News anchor persons John and Marsha appear confused and alarmed, but they quickly rally. The anchors regain their composure. JOHN: We seem to have lost our signal from the Holy Oil Olive Ranch. The view on the screen behind the anchors shifts to Edgar Glotz, who sits at a mahogany desk. The wall behind him is covered with books, apparently real. MARSHA: But right now, we have with us our Breaking News church and state expert, Edgar Glotz, to discuss this breaking news. What do you make of this, Edgar? Edgar appears both expert and informed. EDGAR GLOTZ: First of all, I’m concerned about your reporter, but in general this certainly is a striking development, Marcia. Requests for assistance from one temple to another are exceedingly rare, but even this situation is covered by the Covenants. Edgar stands, looking professorial. As he speaks, appropriate graphics and images fill the screen. MARSHA: Explain the Covenants to our audience, Edgar. The General Orders Defining Spirituality — G.O.D.S. — are popularly known as the Covenants. They were developed when major religions threatened to make independent gods irrelevant. The Covenants cover what should and shouldn’t be done by gods in relation to human society, and up to now the gods have agreed to restrain themselves by following these rules. The screen behind the anchor desk switches to an overhead view of California Highway One. 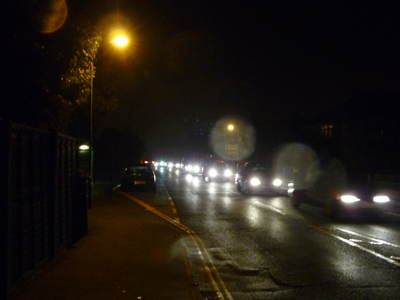 The glow of vehicle headlights, visible through the nighttime fog, moves slowly along the road. JOHN: Excuse me, Edgar. We have breaking news from the Breaking News Copter, where reporter Ashton Smart is on his very first assignment. Do you have the SUVs in view, Ashton? The caravan of headlights turns right at an intersection. ASHTON [speaking over the whuff, whuff of helicopter blades]: That’s right, John. We can just make them out heading south on Highway One. Wait — they’re taking the road to Bolinas. The line of SUVs, followed by a pickup truck, pulls up to the Bolinas Mall and stops in the middle of the parking lot. A number of mercenaries get out of the SUVs. The overhead view from the Breaking News Copter Cam shows the mercenaries gathering next to the first SUV. ASHTON: There appears to be a meeting taking place. The Copter Cam zooms in on Tiffany, standing next to the back door of an SUV. Microphone in hand, she stalks toward the group of mercenaries, followed by her cameraman. The Breaking News image shifts to a ground view from behind Tiffany, who is marching into the middle of the mercenaries. JOHN: Just a minute, Ashton, we have a signal from Tiffany. The men nod and run toward the mall buildings. COLONEL SMITH [to two of his men, ignoring Tiffany]: Make sure there’s nobody in there. Balboa approaches, coming up the line of SUVs. TIFFANY [thrusting her microphone into Colonel Smith’s face]: What’s going on here? COLONEL SMITH: [gesturing to his right]: He thinks he’s in charge, so talk to him. I’m busy. Balboa rummages in the pockets of his priest’s robe and pulls out a piece of paper. TIFFANY [turning to Balboa]: Tell our viewers what you’re planning to do. Behind Balboa, the two mercenaries who inspected the mall buildings return and report to Colonel Smith. He nods and issues orders. BALBOA [preening for the camera]: I’m going to make a statement on behalf of the Temple of Olema. Mercenary soldiers open the back of one of the SUVs and take things out. They move smartly to the mall buildings, where they break windows and throw things into the stores. There are muffled popping noises, followed by an orange glow. BALBOA: This mall has introduced the cancer of commercialism to the previously unspoiled community of Bolinas. Flames, seen through broken windows, blossom inside the stores. TIFFANY [startled, interrupting Balboa]: You’re burning the mall! The fire, licking at the roof of the mall, casts a flickering light across the parking lot. TIFFANY [dumfounded]: But … But … I’ve shopped there! The video screen behind the Breaking News anchor desk splits into two sections, one showing Tiffany and Balboa, the other an aerial view of the mall. VOICE OF MARSHA: Just a moment, Tiffany. Ashton, what can you see from the Breaking News Copter? Both video views show the Bolinas Mall fully involved in flames. ASHTON: The entire mall is burning. Oh! This is way, way out of control! VOICE OF JOHN: Calm down, Ashton. In a rare Breaking News moment without talking, the faint sound of sirens can be heard in the background. Breaking News anchor persons John and Marsha sit behind an anchor desk designed to be visually welcoming and glamorous, while conveying authority.